What to know what we are up to these days? Visit us at WireLoad.net. 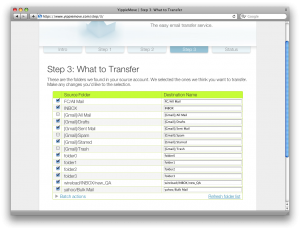 YippieMove is Email migration made easy. We developed this service to help people transfer from one email account to another. YippieMove can also be used to archive important emails. You may email us by concatenating 'blog', '@' and 'wireload.net' into a complete email address. Let me start by saying how much we appreciate the feedback from you guys. Your feedback is an important element in the way we drive the development of YippieMove. Thanks to you guys’ feedback, we’ve now decided to remove the default prefix in ‘Step 3′. That is, in the past, when you’ve made a transfer with YippieMove from, let’s say, Yahoo Mail, all the transferred folders would by default end up under a sub-folder on the destination side named ‘yahoo’. However, as many of you guys pointed out, that is not a preference. Instead, a you would rather see a seamless migration (ie. the old Inbox would end up in the destination Inbox). For those of you who do prefer to still utilize our ‘prefix’ feature, that is still possible. Simply click on the ‘Bulk action’ text below the folders and select ‘Use a name pattern’. A window will now pop up where you can enter your prefix (eg. some-prefix/$SOURCE_NAME$). Again, let me reiterate how much we value your feedback. If there’s anything you like or do not like about YippieMove, please let us know! Logo photo by William Picard. Theme based on BlueMod © 2005 - 2009 FrederikM.de, based on blueblog_DE by Oliver Wunder.